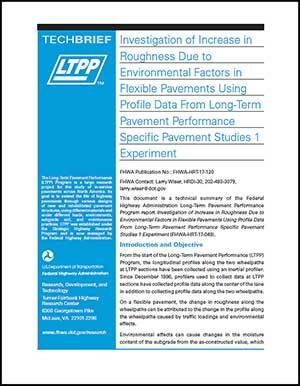 This document is a technical summary of the Federal Highway Administration Long-Term Pavement Performance Program report Investigation of Increase in Roughness Due to Environmental Factors in Flexible Pavements Using Profile Data from Long-Term Pavement Performance Specific Pavement Studies 1 Experiment (FHWA-HRT-17-049). From the start of the Long-Term Pavement Performance (LTPP) Program, the longitudinal profiles along the two wheelpaths at LTPP sections have been collected using an inertial profiler. Since December 1996, profilers used to collect data at LTPP sections have collected profile data along the center of the lane in addition to collecting profile data along the two wheelpaths. On a flexible pavement, the change in roughness along the wheelpaths can be attributed to the change in the profile along the wheelpaths caused by traffic loadings and environmental effects. Environmental effects can cause changes in the moisture content of the subgrade from the as- constructed value, which can cause the subgrade to shrink or swell. This can affect the profile of the pavement and cause a change in roughness. Freezing temperatures can cause frost heave, which can also affect the pavement profile and cause an increase in roughness. Therefore, the interaction between environmental effects and subsurface layers can cause a change in the profile of a pavement, thereby increasing the roughness of a pavement. When evaluating the changes in roughness that have occurred along the wheelpaths, environmental effects could not be separated from traffic effects because the collected profile showed the consequences of both factors. On a flexible pavement, the change in roughness along the center of the lane was expected to be mainly affected by the change in the profile that was due to environmental effects. The only traffic the center of the lane experienced was when vehicles changed lanes, and such maneuvers were expected to apply only minimal traffic to the center of the lane. In flexible pavements, transverse cracking can occur because of thermal movements induced on the asphalt concrete (AC) surface, and this cracking can also increase the roughness along the center of the lane. Hence, along the center of the lane, transverse cracking and the interaction between environmental effects and subsurface layers that cause a change in the profile can cause an increase in roughness. The International Roughness Index (IRI) is an index that is commonly used to characterize the roughness of a pavement. State transportation departments use the mean IRI (MIRI), which is the average of the left and the right wheelpath IRI, to monitor the roughness of their pavement network. The MIRI values computed from the profile data collected at the LTPP Specific Pavement Studies 1 (SPS-1) experiment, which was developed to investigate the effect of selected structural factors on the long-term performance of flexible pavements that were constructed on different subgrade types and different environmental regions, were used in this research. The objectives of this study included analyzing the center of the lane IRI (CLIRI) and MIRI at the test sections to evaluate changes over time, comparing the change in CLIRI and MIRI at the test sections, and investigating the effect of subgrade and environmental parameters on the increase in CLIRI.